The Korea Herald published an infographic yesterday that represents South Korea's trade balance in ICT and non-ICT industries over the past fourteen years. (click on the image to see a full size version of the graphic) The trade data provide empirical support for the idea that the ICT sector is the engine driving this nation's remarkable socio-economic development in recent decades. The role of that sector looms even larger when one considers that information and communication technologies are what economists refer to as general purpose technologies (GPT), whose impact is felt in all sectors of the economy and society. These technologies also enable the pervasive processes of digital convergence that have made ICT an important component of innovation and productivity in all industries. 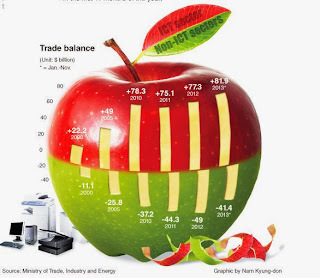 Whether intentional or not, the choice of an Apple to represent South Korea's ICT strength is interesting as it may trigger various associations, including those with the company of that name. Do Koreans enjoy Internet freedom?